Art is a life-and-death matter for Katie Musolff, whose work is now on exhibit at Tory Folliard Gallery. Last fall, Katie Musolff’s father died and it hit her hard. In her blog she wrote about that loss, noting that “the absence of life sticks to us.” Life and death and nature loom large in her art. 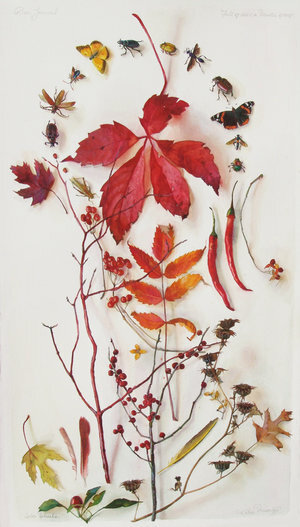 Musolff paints sincere depictions of wild life and foliage she encounters near her home along the Mississippi River. 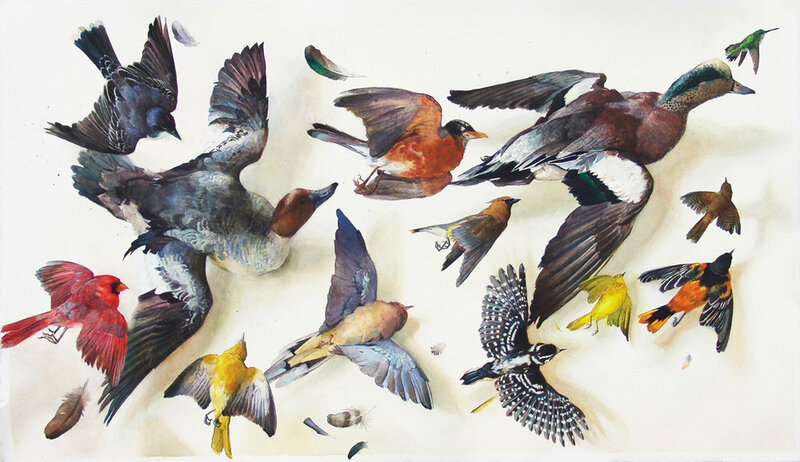 Her work takes patient observation, capturing small moments to create works you might call celebrations of the beauty that life’s inevitable correlation to death produces. Viewing Musolff’s work, one is struck by the detail and accuracy that she achieves, reminiscent of masterful artists of the past. Like them she has been practicing water color and gouache, her mediums of choice, for most of her life, giving her a virtuoso’s fluidity and control that can inspire wonder for its trump l’eau effects and well-choreographed compositions. Musolff, 36, is a West Allis native who has shown work around the country and is married to fellow talented Wisconsin artist Andy Fletcher. I had a chance to discuss her life and work and their new show together at the Tory Folliard Gallery. Q: How did you first get interested in art? A: I was interested in art from the start. I never really strayed from my love. I came from creative family. Q: When did you first begin to consider yourself as an artist? A: In high school. I had cards made up in graphics class and handed them out. I did some commissions for my teachers, mostly of their children and pets. Q: Where did you get your degree(s) and how important was that to your development? A: I got my BFA from the Milwaukee Institute of Art and Design. It was a no brainer, I didn’t even move out of my parent’s house, we lived 10 minutes away. MIAD, like any art school, had its pitfalls and triumphs, I had some amazing teachers, and good teachers are what make a successful education. I also felt like some classes were a real waste of my time. Q: Did you have any mentors who played an important role in your growth? A: My dad taught me how to control watercolor as a child. It was like learning a second language. Q: What artist(s) most inspire or influence you, dead or alive)? A: I love Alice Neel, Rembrandt, Andrew Wyeth. Q: You’ve referred to watercolor as a “second language,” how has that language evolved for you? A: Well, I’ve just gotten better acquainted with it. More confident, more comfortable. I don’t exactly have a predisposed idea of what a watercolor should be like. I just keep painting until I get the feeling and effect I want. I can be very abusive to my watercolors… Demanding a lot from them. Q: Your husband Andy Fletcher is also a very talented painter, how have you two affected each other’s work? A: You are right, he is talented. And he has a great effect on me and my work. I moved out to the Mississippi River because of him. I started painting fish because of him. In fact, in many ways, I kind of copied his earlier work, but have since made it my own. Mostly, he effects my work ethic, and confidence as a painter. I am stronger because of him. Q: Is it ever challenging to be married to a fellow artist, is there ever any jealousy towards one another? A: Andy and I are terribly competitive but not so much with the painting. At times, it peeks its head out, but mostly we respect one another a great deal. But we are ruthless when it comes to cards or scrabble. We both want to be the best. But the top reason we are still together is because we are sympathetic to each other’s struggles in a way a non-artist may not be. Q: Where does this show at Tory Folliard Gallery fit into your history as an artist? A: This is our second joint show with her. We just joined the gallery in 2015. We have never worked with the same gallery before. Mostly, Andy and I sell our work at fine art fairs around the country, so the gallery world is a bit new. Independently, we have worked with galleries from time to time. Q: As more things and processes become digital, you still frequently work observing your subjects from life. Why is this important? A: Well, being mindful and in the present is very popular nowadays. I feel people are always trying to achieve this level of happiness and peace, and that usually involved putting your phone down. Being in nature and directly observing it is an act of respect and it’s good for my soul. Q: Could you discuss your work’s relationship to death? A: It’s everywhere man. My dad just died last fall. So, a lot of the work in the show reflects that, although it may not be obvious. Death allows me to get close to things without disturbing them. I can pick up a dead bird and hold it, learn from it and not bring harm to it. Death gives me a quiet window to work in. It doesn’t scare me. Although, believe me, I’d rather the things I paint were alive rather than laying out on the table in my studio. But I am an opportunist, so I take what I can get. Q: What do you hope viewers bring home with them after viewing your work? A: I want them to feel the sacredness, quirkiness and chaos of the natural world around them. I want my work to make them feel like a kid and go outside and play. I want to make people more curious. Q: Can you discuss your creative process? A: I don’t wait for a feeling to strike. I work like anyone else works. Everyday. But I love my job. I get to go outside, dig in the dirt, find cool stuff and bring it home to look at it some more. Then I paint it and put it back… usually. Q: What do you love or dislike about the current art scene? A: I have found that being too involved with the current art scene bums me out and disorientates me. I love museums instead. Don’t misunderstand me, there are lots of great artists out there, I just find that if I stick to my own world and make work that is true to my heart, it’s better for me. I don’t want to get caught up in anything else. I do like connecting with other artists who are sincere in what they do and having that personal bond, but without the trappings of lectures and art speak. Q: What is the first work you ever sold? A: I sold my first drawing at a craft fair when I was 9. It was of my bunny, Cindy. It was $5. I cried, and the nice lady gave me back my drawing and let me keep the cash. I have since gotten better. Q: Is there anything you collect? A: Oh my, yes. Lots. Bugs, people, stories, mushrooms, books, ceramics, dirty jokes… I could keep going. Q: What’s your favorite work of art you created, and why? A: I have a painting in our living room of my dad. It’s one of many but this one is special because of the time we got to spend together. He is wearing one of his helmets in it… He collected swords, shields and the like and he posed in a French metal helmet with an ostrich feather on it. My other favorite is a self-portrait I made when I first met Andy and knew I loved him. Q: What do you think is the biggest misunderstanding or misconception about visual artists? A: That we don’t have REAL jobs, that we are ditzy, that we don’t work as hard as other people. Just come to my studio and see my schedule any day and tell me that. The work Andy and I do takes a lot out of us because it’s hard to be creative and put out as much emotion and sincerity in everything we make. Q: Has the internet improved or degraded the art world? A: Don’t get me started. No, just kidding. The problem and success of the internet is always the same: It allows anyone and everyone to have a voice and it allows anyone and everyone to have a voice.